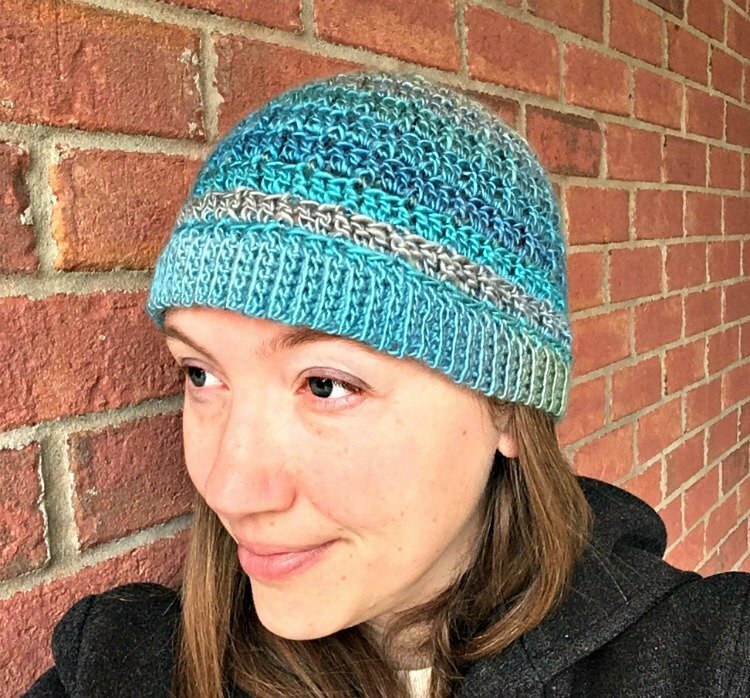 Simple Textured Hat - Free Crochet Pattern - love. life. yarn. It’s that time of year again!! I am so excited to bring out my hooks and needles and start making some cooler-weather projects. I adore hats, scarves, mittens and more and September is when I usually start planning my holiday crafts. This gives me plenty of time to work on everything without feeling rushed, and with a new baby on the way in December I am going to need the extra time to get some projects done!! I created a messy bun version of this hat last year and since I cut my hair I needed a more traditional hat style. 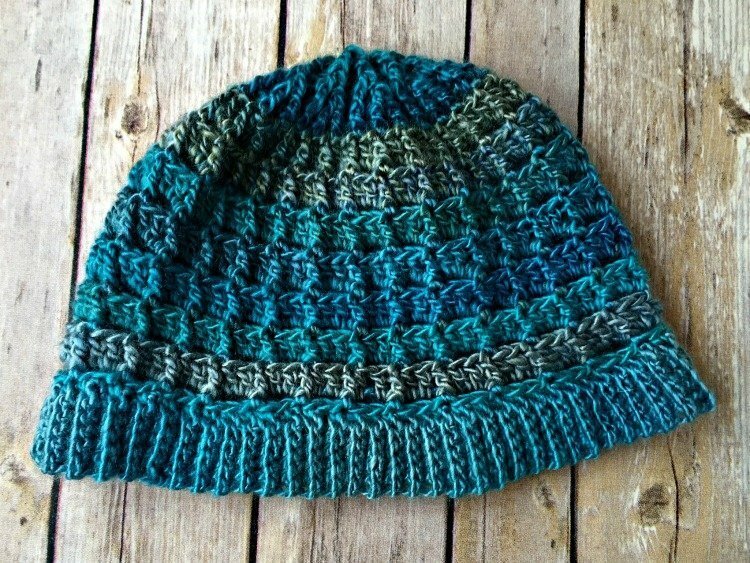 I love this yarn and stitch pattern together so it was a no-brainer to whip up the same hat but close up the top. If you like, you can follow along with the video tutorial that I made for the messy bun version – it includes the entire pattern except the last round, and the last round is just repeating the one before it so it should work great! I am taking a break from published work and concentrating on free patterns for the blog since we are waiting for our fourth (!) little guy’s arrival in the next couple of months. I’ve been working tirelessly on projects that I can’t share yet but now I feel like I have more breathing room and can catch up on all the things I would like to do with this website, so be on the lookout for new free video tutorials (you can check out my youtube channel here! ), lots of new free patterns, round ups and more! Notes: Do not turn at end unless instructed to do so. Ribbing is worked in rounds and turned but body of hat is worked in rounds without turning. Favorite this project on Ravelry! With smaller hook, ch 7. Row 1: Sc in 2nd ch from hook and each ch across – 6 sts. Row 2: Ch 1, sc back loop only in each st; turn. Repeat row 2 until piece measures 20″ from beginning, ending with a WS row. Join with sl st to beginning. Round 1: Ch 1, sc 87 sts evenly around, join with slip st to first sc – 87 sts. Round 2: Ch 1, sc in same st as join, *ch 2, skip 2 sc, sc in next sc; repeat from * to last 2 sts, ch 2, skip 2 sts, join with slip st to first sc. Round 3: Ch 3 (counts as dc), *2 dc in ch-2 space, fpdc around sc; repeat to last ch-2 space, 2 dc in ch-2 space, join with slip st to turning chain. Round 4: Ch 1, sc in same st as join, *ch 2, skip 2 dc, sc in fpdc; repeat from * to last 2 dc, ch 2, skip 2 dc, join with slip st to first sc. Rounds 5-14: Repeat rows 3-4. Round 15: Repeat row 3. Round 1: Ch 1, sc in same st as join, *ch 2, sc in next fpdc, ch 2, sc in next fpdc, ch 1, sc in next fpdc, repeat from * to last 5 sts, ch 2, sc in next fpdc, ch 2, join with slip st to first st – 78 sts. Round 2: Ch 3 (counts as dc), *2 dc in ch-2 space, fpdc around sc, dc in ch-2 space, fpdc around sc, dc in ch-1 space, fpdc around sc; repeat from * to last 2 ch-2 spaces, 2 dc in next ch-2 space, fpdc around sc, dc in last ch-2 space, join with slip st to turning ch – 68 sts. Round 3: Ch 1, sc in same st as join, *ch 1, sc in fpdc; repeat to last dc, ch 1, join with slip st to first sc – 58 sts. Round 4: Ch 3 (counts as dc), fpdc in each sc, join with slip st to turning ch – 29 sts. Round 5: Ch 3 (counts as dc), fpdc2tog, *fpdc, fpdc2tog; repeat from * to last 2 fpdc, fpdc2tog, join with slip st to turning ch – 18 sts. Round 6: Ch 3 (does not count as dc), *fpdc2tog; repeat from * to end, join with slip st to turning ch – 10 sts. Round 7: Repeat round 6 – 5 sts. Cut yarn, leaving a long tail. Weave tail through remaining 5 sts and pull tight to close. Use tail to sew seam in ribbing. Weave in ends. Bloggers: Seeking designs for your upcoming roundup? I’d love for you to feature my work! You have my permission to use one photo in your roundup post as long as a link is provided back to the associated pattern page. Please let me know when your post is published so I can share it on my social media, too. Thank you! Sign up and Get the eBook FREE!